EVA Air is an Taiwanese airline based in Taipei Taoyuan Airport, and is shortly joining Star Alliance (on the 18th, actually). Their award availability will be up shortly, but it seems like Lifemiles has jumped the gun and opened the option to book EVA Air Flights. 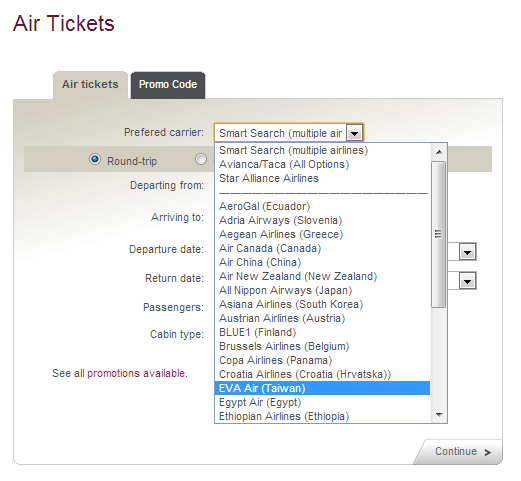 Their results will show up in the award search or you can select an option to just use EVA Air. If you don’t have lifemiles, you should be able to book these flights within the next few days with other Star Alliance miles. Their award space is pretty amazing so far on the few routes I’ve searched. For example, here is a search from HKG-LAX. United has 1 seat for 1 person. Obviously you can do better searching segment by segment, but as a benchmark, there is absolutely no space during the month of August. 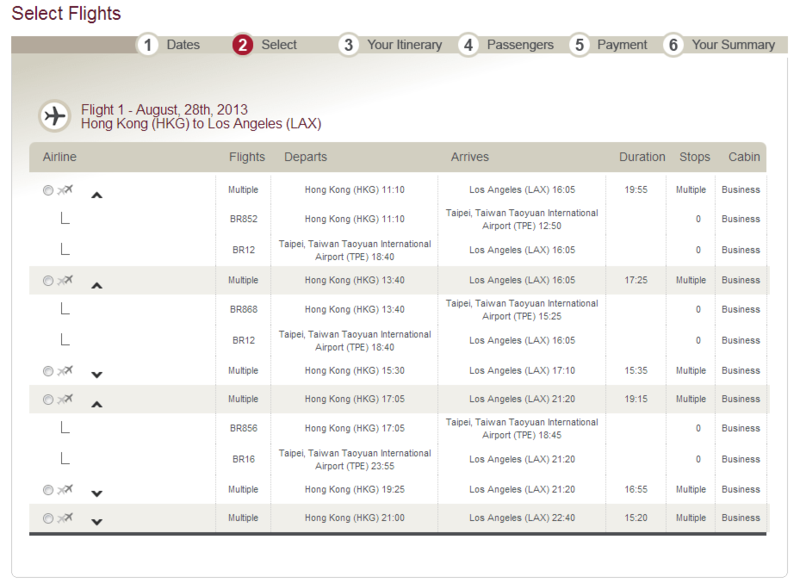 But EVA is releasing at least two business class seats on multiple dates on TPE-LAX. This is also a route with their new business class full-flat seats (Royal Laurel Class) in reverse herringbone formation which looks like one of the better Star Alliance options across the Pacific in business class. Other destinations that are served with the new product are Toronto, New York JFK, and San Francisco. They also serve Dom in business class although the several reviews I read say that they have an inconsistent soft product. But I’m fairly sure that they will be better than United. Very interesting how they don’t have a logo yet for the Lifemiles searches but that doesn’t matter as Trans-Pacific routes I’ve looked at have plentiful award space throughout the year. I would guess that EVA Air redemptions with other star alliance partner members should be out by next week if not before the end of this week. The rates for mileage accrual with Aeroplan and United MileagePlus should also be out also. I am really hoping that Aeroplan will not put YQ on BR. I still find it crazy how Lifemiles are still such a good deal. Even at 1.5 cents, that means a one-way business class ticket is just over $950 (excluding fuel surcharges and airport taxes. So for the traveller who has lots of flexibility and time to find these spots and stay up to date on this sort of news, that means you save thousands of dollars on buying revenue tickets. Start booking! Award availability is only going to get worse and worse as more people discover the abundance of award space. I am on Facebook and Twitter – stay up to date on the latest information! If you liked this post, you can also signup for emails to get one daily message with all my posts. You could at least acknowledge the guy on FT who started the thread. That is the problem with this blog. you are using on your blog to increase your traffic. The the claims of ‘best and original content’ – forget it, you won’t find it here!!! Thank you for being a unique visitor and increasing the pageviews you are bringing here. I appreciate it. If there are problems with this blog feel free to send an email on how to improve.